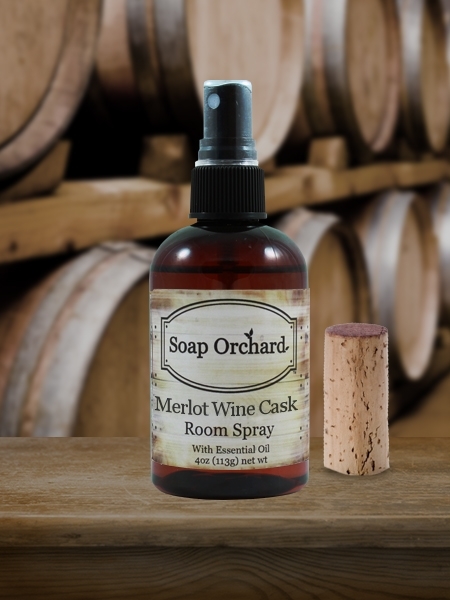 Merlot Wine Cask Room Spray has a fruity Merlot Wine scent and an uplifting Orange finish. It also has a special scent surprise: a hint of tobacco leaf. This is a surprisingly wonderful scent! Men will love this one too. Orange essential oil has properties as an anti-inflammatory and antiseptic. It helps relax muscles. Its scent is wonderful at alleviating anxiety, anger and depression. The key ingredient that the room spray formulation is derived from is Soy Bean - a deodorizing agent that rather than masking the odor causing molecules it attaches to, eliminates them. This wonderful spray is an alcohol free, water based room and linen spray formula. Perfect for use at home, the office, dorm and hotel rooms or any space that you want to neutralize bad odors instantly. Our Room Spray is a great solution for neutralizing pet odors, cigarette smoke, cooking and bathroom odors. Freshens and deodorizes linens, towels and clothing with a unique conditioning agent. Most air fresheners and odor eliminators rely on perfumes to counteract the foul smelling rancidity associated with the by-product of biological and organic decomposition. Perfumes contained in air fresheners provide only very limited odor control, and only a short term masking of offensive odors. The distinct chemical components that constitute disagreeable smells of decaying organic matter are typically represented as low molecular weight fatty acid, mercaptans, amines, ammonia, and hydrogen sulfide, on which perfumes have little or no long lasting effect. Soya Morpholinium Ethosulfate, derived from Soy Beans, exhibits exceptional odor nullifying properties. It is the key ingredient behind this effective formula. This composition is water-based and features semi-rigid, concave molecular structures. The theoretical internal cavities of these concave molecular structures have the unique ability to "capture" odor-causing molecules. Soya Morpholinium Ethosulfate functions by both complexing and neutralizing certain odor molecules. The unique formulation using Soya Morpholinium Ethosulfate and natural essential oils and fragrance oil blends create one of the best fabric and room sprays for the odors in your space!